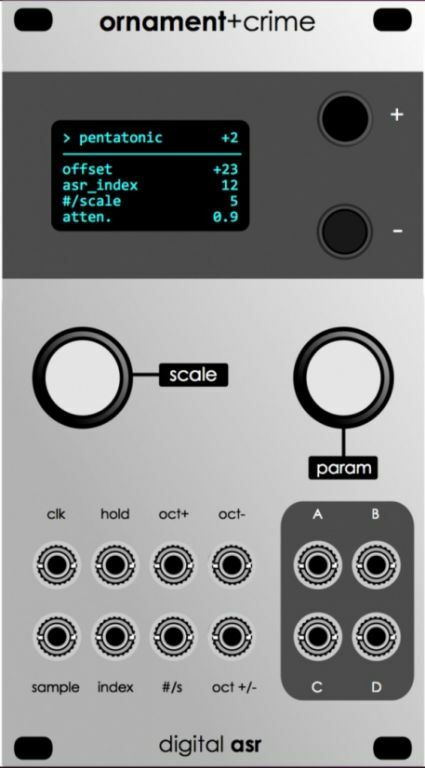 just saw some wonderful demos of this and i am about to commission one for my rig. I am interested in hearing other people's experience with this module. I am very impressed by the functions and it seems like a pretty darn cool module. 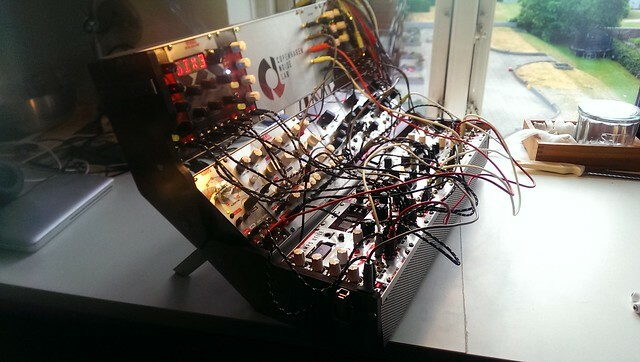 Hadn't heard of this before so found a picture on modulargrid. Seems like an interesting module. Many new digital modules now have small lcds or tfts, that's nice! Because it's a diy module, lots more info and link to demos on original thread. Building a second one, as I want to have one in the main case in the studio too as my current o_C is in my folding case. this is awesome. about to pull the trigger with my builder guy. i need to make some room for it but i am excited. Seems like the Omnimod is still a distant possibility but I waited patiently for almost 8 months or so. I need to find someone to build me one in EU it's also replacing the Omnimod on my grid. I need to find someone to build me one in EU :hihi: it's also replacing the Omnimod on my grid. fwiw, i wouldn't ever advertise this as a replacement for Omnimod. though, as far as one can tell, the hardware is fairly similar (same processor (MK20), some quad DAC, an OLED display and two encoders), the intended purpose for this particular thing (o_C) is to quantize stuff, not drawing your own waveforms (if this is/was the idea behind the Omnimod; i don't know). at any rate, there's no such drawing "modes" in o_C (though there's a bunch of envelope- and LFO-type modes); and that's why it's SMD (the idea being to use a good/high precision DAC), unlike many/most other DIY modules. also and evidently, the display we've used is smaller (we've tried with the larger 1.5" displays but these use a different, less robust controller, which, in this particular configuration, would have severely impacted on the overall performance). there's no plans to manufacture this (to answer some PMs); you'll have to do it yourself, as it were; or find someone who'll build it for you, as was mentioned above. Just pulled the trigger on mine. I am excited to get it and i am going to be making some room for it in my case. if you're in berlin, there'll be a little show and tell type event this Thursday evening (21/07), 6pm, at the Schneidersladen showroom. it'll feature the module, me and thomas. the plan is we'll chat a bit about how the module came about (an internet love story, of sorts*) and what it is, how it works and potentially other things, too (DIY, displays, whence the silly name, ...). * which is why pld and timmy/bennelong.bicyclist can't be there, unfortunately. Really excited to build this. Any leads on metal faceplates? yes, like Thursday the day after tomorrow. i've left one in the showroom though, so chances are it'll still be there next week. no, it's tricky to supply metal faceplates in low volumes at a decent price. there's dirkwiggler's pcb panels, which look very nice. the blank .fpd templates are here; and maybe (i don't know) Altitude909 might still do them. Now that s a nice faceplate. If these are available I'd definately commission one. But the labels would not make sense much of the time. True. I mainly just meant a normal, metalphoto aluminum panel. The jacks can be generic ins and outs as far as I'm concerned. Altitude909 is the one to talk to then-he's making one for me with an Al panel. yeah, they wouldn't. that labelling is still from the days of the old/initial firmware which has been phased out / partly merged into the 'extended' firmware. i've replaced the picture now to avoid confusion. the ideal scenario i guess would be a panel made entirely from OLED or electronic paper or something... maybe in 2020. Oh that would be awesome. How small of size do that make e-ink screens? Imagine little scribble strips under knobs and jacks. 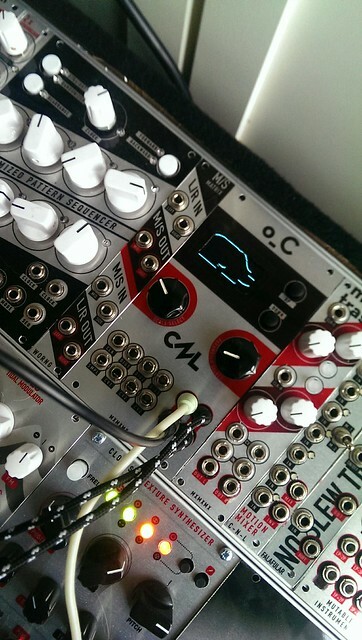 That'd be perfect for today's multifunctional module like peaks, Disting and Orn+Crime. Just emailed a supplier of alternate faceplates (yes, there are more than one) and was told that they are testing out prototypes of faceplates for this. Did you make a video from yesterday? fwiw, here's a little collection of videos, in descending quality.